Louse is the common name for members of over 3,000 species of wingless insects. They are obligate ectoparasites of every avian and mammalian order except for monotremes, bats, whales, dolphins, porpoises and pangolins. 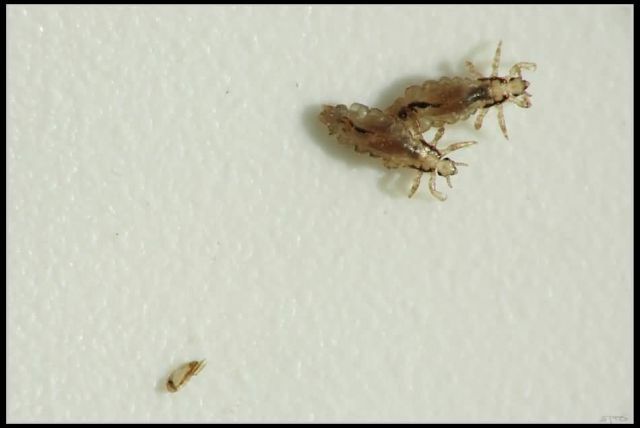 Most lice are scavengers, feeding on skin and other debris found on the host’s body, but some species feed on sebaceous secretions and blood. Most are found on only specific types of animals. In humans, different species of louse inhabit the scalp and pubic hair. Lice generally cannot survive for long if removed from their host. A louse’s color varies from pale beige to dark gray. However, if feeding on blood, it may become considerably darker. Female lice are usually more common than the males. A louse’s egg is commonly called a nit. Many lice attach their eggs to their host’s hair with specialized saliva. The saliva/hair bond is very difficult to sever without specialized products.